Missed our workshop and still want to use RefWorks? Investing 20 minutes viewing this tutorial and creating an account with your Bentley email address will save you time writing and editing your research papers. If you would like more information about this resource (or any of the library’s databases), please contact us for research assistance. If you would like a demonstration of RefWorks for a class, please schedule a research instruction class using the instruction request form. Tuesday, December 4th, 2:00 to 3:00 p.m.
Wednesday, December 5th, 2:00 to 3:00 p.m.
Thursday, December 6th, 5:00-6:00 p.m.
FAQ: How do I find a specific article? “My professor said I could get this article at the library, but I don’t know how to find it”. 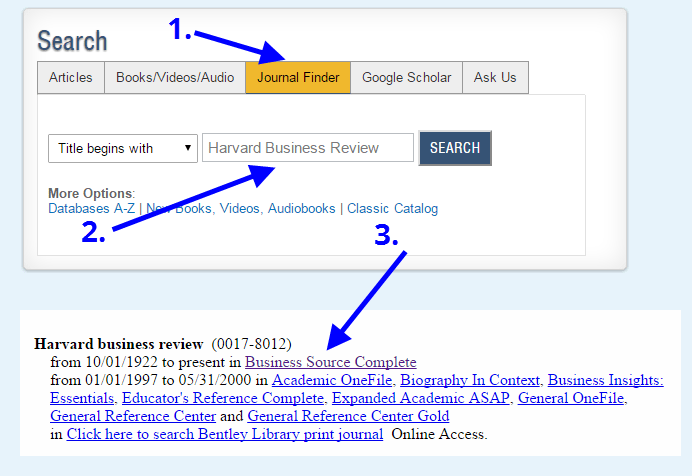 Go to the library’s home page and click on the Journal Finder tab. Enter the name of the journal, magazine or newspaper in the search box and click [search]. The Journal Finder will tell you if the full-text is available, the database it can be found in, and the dates for which it is available. It will also tell you if the library has a subscription to the print journal. Click on the appropriate link to search for the article in that database. What if the article isn’t available in any database or in print at the library? Don’t worry, the library can obtain a PDF copy of the article for you, for free, and usually within three days! Request a copy of the article you need via Interlibrary Loan (ILL). Login to ILLiad with your Bentley username and password, click the link for “Request New Item – Article”, then complete and submit the form. What if I’m not sure I have the right information, or that I am looking it up correctly? It’s not unusual to have an incomplete or incorrect citation. Don’t give up! Reference librarians are happy to help you decode mysterious citations and locate articles. Contact the Reference Desk for help. Find answers to more library FAQs in AskUs, the library’s FAQ database. FAQ: What is a scholarly article and how do I find one? Professors often require students to use articles from scholarly journals in their research papers and assignments. Scholarly journal articles are written by researchers, academic scholars or experts in a field and are written for a targeted audience that includes other researchers, scholars and specialists. Is scholarly the same thing as peer-reviewed? The terms scholarly, academic, peer-reviewed and refereed are often used interchangeably to refer to scholarly journals; however, strictly speaking, they are not all the same. Peer-reviewed and refereed journals are scholarly journals that put articles through a formal review process before they are accepted for publication. The review is conducted by a group of acknowledged experts (peers) who review the author’s research methods and consider the article’s contribution to the existing literature and body of knowledge in order to ensure a level of quality, value and academic merit. It is important to note that while most scholarly journals are peer-reviewed, articles can be scholarly without being peer-reviewed or refereed. Essentially all peer-reviewed and refereed journals are scholarly, but not all scholarly journals are peer-reviewed or refereed. If you are unsure what your professor expects, ask them to clarify. How you go about finding scholarly articles depends on your topic, but most library databases allow you to limit your searches to scholarly or peer-reviewed journals. Keep in mind that not everything published in a scholarly journal is a scholarly article (e.g. book reviews, editorials, letters), so you will still need to evaluate each article individually, looking for the scholarly characteristics highlighted above. Conduct your search, then use the facets to filter to the scholarly articles. The library offers many scholarly journal databases. (In fact, some databases contain nothing but scholarly content, in which case you may not see these limiters.) To identify the best resources for a specific subject, use the subject filters on the databases page, or ask a librarian to recommend databases to search. You can verify that a journal is scholarly or peer-reviewed by looking it up in Ulrichsweb Global Serials Directory. Ulrichsweb provides detailed descriptions of journals, including whether or not a journal is classified as scholarly and if it is peer-reviewed or refereed. 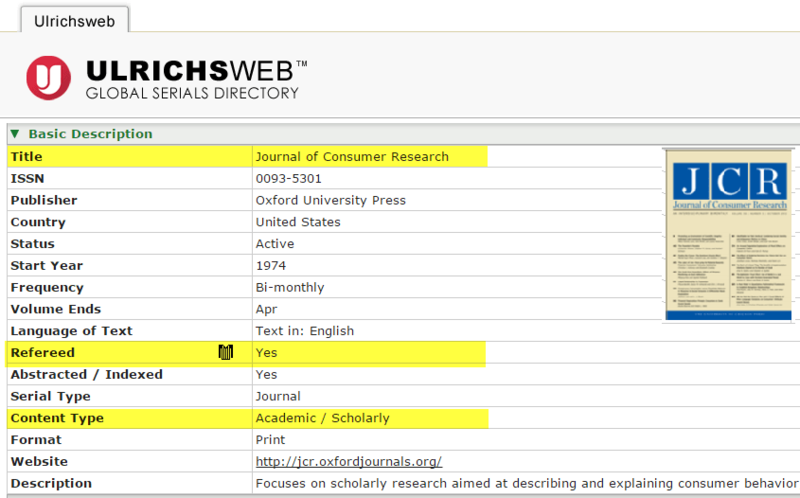 For example, Ulrich’s tells us that the Journal of Consumer Research is academic/scholarly and refereed. Have questions about scholarly articles? Stop by the Reference Desk, call 781.891.2300, send email to refdesk@bentley.edu or contact us using our chat/IM widget. Or, check with your professor to ensure that your article meets the standards required to be deemed scholarly.